This book grew out of the joys and challenges the author experienced as a Spanish/English bilingual teacher of culturally and linguistically diverse students. It tells what it is like to be a bilingual teacher. As a result, it helps other teachers and prospective teachers understand the complex nature of bilingual teaching, shares some successful teaching strategies that other teachers have used, and encourages teachers to find their own solutions despite limited support. The book is structured in three parts. The introduction explains how the book evolved, defines its relation to other qualitative research, and offers suggestions for how to use the book. The second part consists of eight bilingual teachers' stories that provide a glimpse of them as people, their schools and programs, their successes and struggles, and their solutions and coping mechanisms within their contexts. It concludes with a discussion chapter that looks at the teachers' collective strengths and struggles comparatively, connecting these to broader issues. The final section presents bilingual education resources -- useful information for practitioners. 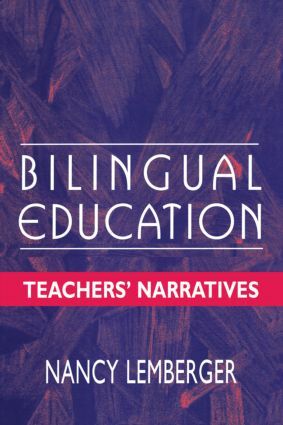 This includes foundation texts on the theories and practices of bilingual education, demographic information, a glossary of bilingual education terms, listings of curricula, tests, and literature mentioned by the teachers, and professional network sources.